A young ambitious sailor who spent six years of his prime in a Greek ship and started a small time import business is now the proud owner of a world renowned brand name. Having started his import business from Japan by bringing down machinery for the maritime industry he also started exporting sea food products to Hong Kong and Singapore. This export import business made him travel to Far Eastern destinations and it was during one of his trips to Thailand that he saw the advancement of computers. “Since I was already involved in imports, I thought that I should also get involved in buying and selling used computers,” he said. S. H. M. Rishan recalled that this business was very successful as he could market these computers at a lower price. Subsequently he opened a showroom at Unity Plaza, Colombo and then expanded his business to Kandy and Kurunegala and now they have 34 other outlets. With the competition intensifying the price advantage he has enjoyed was narrowing and he has looking out of a way to give the cheapest and the best for Sri Lankans. The brain storming sessions to find an answer to this question was the birth of Sri Lanka’s own Panora computer five years ago. From Panora he has taken PC House to the BPO sector and to the pharmaceuticals and are looking for more opportunities. Q: Did you not think that it was a risk to invest in a local brand when there were so many cheap imported computers in the market? Yes it was a big risk as I knew that it was not easy to sell a locally produced computer like marketing an umbrella or a radio. Many advised me that Sri Lankans would not invest many thousands and trust a local computer brand when so many world famous brands were freely available. I knew that if I was to make an impact I have to give out a good quality high performing product at a competitive price and Panora stood up to this demand. Q: What was the investment for the process? I purchased a land in Mattakkuliya and invested Rs. 200 million to have a factory for this computer business. Since the birth of Panora I have been increasing value addition and soon I can give a 100 per cent Made in Lanka computer. Today PC House is the Business Partner in Sri Lanka for many international brands such as Intel, Philips, Gigabyte, Logitech / Labtec range of products, Power Tree Uninterruptible Power Supply Systems and Philips PC Peripherals. They also boast of their own branded PC “Panora”. PC House is also business partner for IBM range of computer solutions and Gold System Builder for Microsoft. Q: What made PC House to branch into Taiwan? Subsequent to the Panora launch and the feed back I received from the customers I knew I have come out with a world class product. Since Taiwan was a country manufacturing computer accessories and electronics I decided that the best way to enter the Asian market and beyond was from here. This move too has been very productive as Panora is now popular brand in the East Asian and European countries. Panora is also being marketed in Bangladesh and the Maldives. Q: What are the new markets for Panora? We are now looking at the Gulf, African market and Pakistan. We also hold over 20 percent market share in Sri Lanka and this is very encouraging for a new and a locally produced brand. I am also happy to note that other local manufacturers too have got the confidence to follow us and put out locally assembled brands. Q: What made you diversify to the BPO sector two years ago? I saw that the Sri Lankan workforce, high literacy rate and Telco infrastructure suits the body chemistry for the BPO industry. I also knew that it would be hard for a newcomer to enter this industry and this was why I acquired local BPO companies that were not doing well. Today these companies have been turned around and I am looking for at least ten more acquisitions this year to expand the BPO business. Q: What are the advancements you are currently looking at? I have observed that the computer ownership in Sri Lanka is very low and in a bid to increase it I want to produce the cheapest computer and market it for less than Rs. 20,000. In addition, PC House is looking at producing a dual powered computer so that it can be used n areas where there is no power which would help to increase the individual computer ownership. Q: How do you see the Sri Lankan economy? It is developing and there are tremendous opportunities for investors. Q: What do you think of the ethnic problem? I think we will be soon looking at a better picture very soon. Q: What do you think for the labour laws? They are not made to suit the business environment. The Board of Investment should study this. As far as PC House is concerned we do not have any problems as I have gone out of my way to make our employees not only happy but rewarding. Q: How do you see the infrastructure in Sri Lanka? The road network has to improve. As far as the IT industry is concerned its infrastructure is far ahead than of the region. Q: What do you think of the entertainment opportunities available for Sri Lankans? These is plenty of entertainment in the City. I think even some developed countries do not have the number of Casinos that are available in Sri Lanka. Q: Where would you like to spend your holiday? I prefer a quiet area and I like being at Kandalama. If it’s overseas I prefer Australia, once again since it’s very tranquil. I also want to highlight the fact that the Be Sri Lankan Buy Sri Lankan is some thing that patriotic citizens must practice. I am not saying this to sell Panora. The fact is that there are many locally manufactured products that are of international standard and buying them encourages the manufacturer to produce new items. Feb 27, Colombo: Sri Lanka's main opposition United National Party yesterday expressed its fullest support for the implementation of the 13th Amendment to the Constitution, at the conclusion of a crucial meeting between President Mahinda Rajapaksa and opposition leader Ranil Wickremasinghe, a government report said. Reporting the positive outcome of the meeting, Sri Lankan media reported that the opposition leader had said that since the interim proposals presented by the All Party Representative Committee (APRC) had included the implementation of the 13th Amendment, and since it was the law of the land, his party would not oppose as it has no objection to the implementation of existing laws. A media release issued yesterday by the President's Media Unit said the two leaders also discussed the 17th Amendment. One daily stated that "the opposition leader also called on the government to appoint the Constitutional Council immediately, and to activate the 17th Amendment to the Constitution to ensure good governance in the country. He also requested the All Party Representative Committee (APRC) to submit a further report on the progress of its deliberations to date." One of the important, and valid messages contained in Satheesan Kumaran's message, published in the Midweek review if The Island of 20th February is that we need bridge-building among the different communities. But he observes it in the breach. Hurling accusations does not help. He claims, "The ethnic conflict in Sri Lanka between the Sinhalese and Tamil-speaking has been a creation by the Sinhala leaders". Then Kumaran proceeds to attack Theravada Buddhism, and gives advice to Buddhist monks. He says "Irresponsible words of politicians in Colombo will only add fuel to the flames of destruction engulfing Sri Lanka politically, economically, militarily, culturally and socially, rather than educate communities on the importance of co-existence." He goes onto claim "what Sri Lankan politicians really want is to create a society of voiceless citizens remote-controlled by a bunch of politicians." Surely, such voiceless citizens already live in the Vanni and how did that come about? We Tamils have not understood how we dug our own graves. Kumaran says, "A national consensus can only be achieved when the Sinhalese embrace the minorities and win their hearts and minds". Here again it seems that only the Sinhalese have to act. Don't we Tamils have to also act to reassure the majority? As an aging Tamil who has observed Tamil-Sinhala politics since the 1940s, I cringe to see the continued repetition of simplified and historically incorrect hurling of accusation, even by a man who recognizes the need for building bridges between communities. People of Kumaran's generation do not know that politicians like D. S. Senanayake (DS) tried to create a "Ceylonese" nation. Much false propaganda has been generated and good men like DS have been besmirched. People like Ponnambalam Ramanathan, in collusion with Governor Maitland introduced the principle of "communal representation" in the legislative process. Some Sinhala leaders rejected this ("Ramanathan's deception"), and then came the Donoughmore commission which proposed Universal Franchise. Surely, it was a defining moment when the Colombo Tamil leaders decided that their dominant position would be threatened, unless they separated themselves from the Sinhalese, and call for a separate identity. G. G. Ponnambalam (GGP) in the State Council in 1934 declared that he was "a proud Dravidian" and rejected the "Ceylonese" concept of a polity of a single people. Natesan and others followed suit, as a reading of the political history of the times will reveal. Ponnambalam lent his voice to a movement which began to attack Sinhala Buddhists, and the Mahavamsa, their famed historical chronicle. Should I remind Mr. Kumaran that the first Sinhala-Tamil Riot occurred in 1939, in Navalapitiya, and spread to Passara, Maskeliya and to many other towns, when the Colonial government stepped in and stamped it out? The riot was sparked by the inflammatory racist speech of GGP in Navalapitiya, attacking the Sinhala Buddhists and the Mahavamsa (see The Hindu Organ, June 1, 1939 and other newspapers of the time). It was then that S. W. R. D. Bandaranaike (SWRD) saw an opportunity, and went to every one of the cities touched by the riots, and established branches of the Sinhala Maha Sabha (see The Hindu Organ, June 19, 1939). It was in this extremely heated atmosphere that GGP developed his fifty-fifty solution as a means of safeguarding the dominant position of the Tamils. Far from bridging the gap between the communities, every action of GGP was designed to drive this "difference" between the Tamils - descendants of the Dravidians, and the Sinhalese, a "hybrid mongrel race split of from the aboriginal Tamils and mixed with Aryan invaders" (as stated by GGP in Navalapitiya in 1939). The racism of the GGP et al was matched by the SWRD group. It would seem that SWRD the feudal aristocrat, and GGP the caste-conscious Catholic lawyer, were both power-hungry manipulators of the people for further their own interests. The elder statesmen of the times, i.e., Baron Jayatilleke, D. S. Senanayake (DS), Mahadeva etc. charted a reasonably non-communalist line. DS in particular realized that public confrontations would be a grave obstacles to independence and bridge-building between the communities. When the Soulbury commission arrived, Senanayake managed to get the "Young Turks" like SWRD and others not to appear before Soulbury, and imposed a formal boycott while making room for informal contacts. GGP however appeared before the Soulbury commission and whenever possible for three months, claiming that the Tamils were being discriminated against in jobs, education, health, colonization settlements, etc. He even objected to the declaration of Anuradhapura as an archaeological conservation area as an act of discrimination. The Soulbury Commissioners rejected virtually all of GGP's claims as being without foundation. It rejected the 50-50 demand, i.e., equal number of seats to the 12% Tamils and 75% Sinhalese as an attempt to subvert democracy. The Sinhala leaders refrained from public confrontation with GGP during the Soulbury period, and this led to a sense of healing between the communities. The state council approved the Soulbury proposals overwhelmingly. GGP leading the Tamil Congress(TC), as well as SWRD and other Sinhala nationalists joined the DS cabinet which believed in the "ceylonese" concept (see Senanayake's Acceptance Speech in the Hansard 1947). Meanwhile, dark clouds were gathering. The ultra-nationalist Tamil wing led by S. J. V. Chelvanayakam (SJV) was not happy. They grumbled about GGP's approach, and proposed that instead of 50-50, the Tamils must pursue the "Two-Nation" concept, where the Tamils are equal to, and distinct from the Sinhalese. SJV said that Tamils should pursue their separate destiny. The opportunity to break from GGP arose with the Indian Citizenship Act. Most Ceylonese leaders and the Colonial government had become worried that the Indian Tamil workers and the Estate sector would fall into the hands of the Marxists who had began militant agitations. The new citizenship act required that only persons with seven years of residency could become citizens and vote in elections, thus eliminating transients. GGP and most other Tamils voted for it. But SJV declared that GGP was a "traitor" to the Tamil cause and used the moment to create the Tamil Arasu Kachchi. SJV contended that the Citizenship Act violated minority rights, and challenged it, and the government, in the courts, and in the Privy Council in London. The unequivocal judgments were that there has been no discrimination before or after the Act, and that the citizenship requirements were as reasonable as in the most liberal European states at the time. Nevertheless, the Arasu Kachchi kept on agitating, determined to drive a wedge between the two communities, i.e., even among the anglicized Colombo citizens. I have attended meetings in Jaffna where the Arasu Kachchi talked of a separate Tamil nation, while in Colombo they sounded moderate and talked of federalism. A golden opportunity for the Arasu Kachchi arrived with the election of SWRD as PM. SWRD was a politician who recognized the rights of minorities, and an accommodation could have been easily reached with him. But the Arasu Kachchi's public position in Jaffna was well known to the Sinhala nationalists who had deep distrust of SJV, E.M.V. Naganathan and others. If there is no trust, there can be no political Pact. It is easy to blame the "Buddhist monks" for the failure of the Banda- Chelva Pact. But what did this Banda-Chelva Pact ask for? It asked for Tamil administrative regions in the North and East. At that time, just as today, the East involved Muslims and Sinhalese and Tamils. The Muslims opposed the Banda-Chelva Pact. The Sinhalese in the East opposed the B-C pact. The Arasu Kachchi had done NOTHING to build bridges between the two communities and win their confidence. Instead, they used every opportunity to confront the Singhalese. Ponnambalam and the TC also opposed the B-C Pact. The B-C pact was NOT based on discrimination. It was based on the "Homeland Concept". It asked for the same 2/3 coastal area and land area as a "homeland" for the Tamils (12% of the population) that the LTTE today is asking for. If the Arasu Kachchi had only asked for the Northern province and if its leaders had reassured the Sinhalese and Muslims, the B-C Pact would have had some chance of survival. If the proposed B-C pact had actually got enacted, the Sinhala nationalists would have demanded the Tamils living in Weallawatai and Kottachenai to leave. The 1983 Black July would have happened decades earlier. I have began from the Donoughmore Era and reviewed the history to indicate to young people like Satheesan Kumaran that the story is not black and white, with the Sinhalese doing all the bad things and "creating the ethnic divide", while the Tamils meekly performed "satyagraha" to win their rights both sides have been at fault. The Tamils in the Vanni and other areas are not like their caste conscious counterparts in, whose only desire has been to retain their political power, and rule the North as absent landlords. The Vanni Tamils ("Malabars" in the language of the 1815 Kandyan Treaty, and also in Cleghorn's report to the Colonial office), like the Singhalese, have a lot in common as our religion, social organization and language are very similar to that of the Sinhalese people. Although GGP and SJV attempted to emphasize differences, these are the same stock of people with mere superficial differences. The LTTE is a creation of the elitist Colombo Tamils who decided to use the lower caste "boys" in far-flung areas to promote their misguided political struggle making our children mere cannon fodder. Meanwhile, their children, kith and kin have gone abroad and continue to finance a psychopath who has eliminated out teachers, our kurukals, writers, journalists, political leaders and thinkers, so as to create a subservient society toeing his line with no questions asked, in the name of Eelam. So, Kumaran what is there to be negotiated? Kumaran is proposing conflict resolution via negotiations. As Anton Balasingham once stated, "Only the borders remain to be negotiated". It should not be forgotten that the Arasu Kachchi, while talking of Gandhian methods, secretly supported the creation of young militant groups. SJV personally met and worked with Sivakumaran, who was the first to commit suicide by swallowing cyanide. I am sorry to say that the Tamil leaders of the 1930s, and then the ultra-nationalist activism of the SJV platform have been largely responsible for the plight of the Tamils today. Blaming the Sinhalese for all our ills won’t do. We need to soften our acrimonious uncompromising stand. Feb. 28 (Bloomberg) -- Sri Lanka's inflation probably slowed in February as interest rates at a 5 1/2-year high helped damp consumer spending and loan growth. Consumer prices in the capital Colombo rose 19.5 percent from a year earlier, after gaining 20.8 percent in January, according to the median estimate of nine analysts in a Bloomberg News survey. The statistics department will release the data tomorrow at 3 p.m. in Colombo. Sri Lanka's central bank last week kept its benchmark interest rate at 10.5 percent, the second highest in Asia, for a 12th straight meeting in a bid to cool inflation without jeopardizing economic growth. Governor Nivard Cabraal is trying to revive the island's $27 billion economy, after growth slowed to an estimated 6.7 percent in 2007 from 7.4 percent in 2006, amid renewed civil war. The central bank is keeping monetary policy tight with its daily open-market operations to adjust the amount of cash in the banking system and controlling credit demand. The government also plans to build stocks of imported wheat, sugar, rice and lentils to help curb inflation. Interest rates are ``sufficient'' to control inflation, which will begin to slow in the second half of this year, Cabraal said in a Feb. 4 interview. Credit growth in Sri Lanka's private sector, including consumers, slowed to 19.3 percent in December, compared with 24 percent a year earlier, according to the central bank. Credit to state companies is expected ``to improve'' this year, the bank said on Feb. 21. Higher oil prices are one of the ``main risks and difficulties we are facing,'' Cabraal said on Feb. 4. State-owned Ceylon Petroleum Corp. and Lanka IOC Ltd., the Sri Lankan unit of Indian Oil Corp., raised fuel prices on Jan. 13 for the first time in almost six months to cut losses caused by record oil costs. The South Asian nation needs to rein in inflation to achieve 7 percent economic growth this year, Cabraal said Jan. 2. Fighting has intensified after the government ended a 2002 cease-fire with the Liberation Tigers of Tamil Eelam rebels on Jan. 16.
Who does tell the truth? Who does want to know the truth? “Tamil civilians locked in endless war”* was the current topic of the France 24, the concurrent channel of the CNN, stationed in France. On 21.02.2008, this channel telecast a TV documentary to highlight the present situation of the Tamils who are supposed to have disappeared, arrested, and evicted. Being a Sinhalese should not be a valid reason for me to have repulsive feelings on the contents of the film. I may be wrong with my inferences in this regard. From humanistic point of view, I am a pacifist and I do wish an end to ongoing war in Sri Lanka. It is the dire wish of everybody living in Sri Lanka except for the Tamil Tiger terrorists and their unseen masters. There are so many questions left behind unanswered. It seems, the GoSL lacks appropriate counter measures to deal with the Tamil propaganda. I am saying it so, because the Tamil politician Mano Ganeshen openly speaks in this documentary on behalf of Tamils. If he represents the LTTE, then our responses must have another orientation. Unfortunately, this terrorist group consists of Tamils and Mano Ganeshen like. It does not say that he is a terrorist but his words are inflammatory and strengthen the terrorists cause. An objective analysis of what Mano Ganeshen utters in this short documentary could shed more light to the issue. His conduct resembles to a camel in the desert, which tries to hide its head against sandstorms but whole body including the naked back is exposed. Let us study a few frames from this film. He is living in luxury, who champions the so-called Tamil cause. His security (Sinhalese and Tamil) is from the Sri Lankan government and the salaries are paid by the GoSL (76% Sinhalese) taxpayers. He starts blaming the GoSL and authorities for having arrested the Tamils in Colombo. He himself knows very well that every country has law enforcement institutions and it is the duty of the government to protect civil life whatever the ethnic identity is. 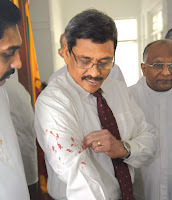 Without this protection from the government, he would have been killed by the LTTE as they did it to his close associate, a member of parliament T. Maheswaren recently. Behind the iron gates and close doors, he pretends to be insecure and fears the authorities and the local community. Ironically, he lives in Colombo amid Sinhalese. He showed his pistol to the interviewer and said it is to protect his life. His conscience knows, he hardly can survive outside Colombo without the protection provided by the government. Unfortunately, he did not use a single word to thank the GoSL for the facilities given to him and for having dispatched the Tamil lodgers to the destination unharmed. It is beyond his grasp what the National Socialists in Germany did to Jews by sending them to another “destination”. He further explained that Tamil lodgers in Colombo were herded even at midnight and dispatched to their home territories. He conveniently ignores to describe the LTTE midnight attacks eliminating innocent villages. He emphatically repeated ethnic cleansing in his speech to let down the Sinhalese, who never did any harm to him. It is not a secret, who is responsible for this ethnic cleansing. Ultimately, he can fool the foreigners including the France 24 Channel and its viewers but not everyone all the time. Predicting that the Liberation Tigers of Tamil Eelam's decline is "inevitable" in the current situation, the Jane's intelligence review has said the outfit is reeling under recruitment difficulties and international pressure over overseas fundraising and weapons procurement. "With its maritime supply routes likely to become limited by its loss of land in north-west, unless a new political or military variable enters the equation, the decline of the LTTE is inevitable," it said. The think tank said even the deadly LTTE attack in October, 2007, at the Anuradhapura air base that led to the destruction of some Sri Lankan aircraft fleet, would not reverse the outfit's setbacks. "The recent ground and air attack in Anuradhapura, despite its psychological impact, is unlikely to reverse the perilous position of the LTTE now at its lowest ebb since the Indian intervention of late 1980s," the report says. Indeed, the death of LTTE political head Thamilselvan in an air strike on November 2, 2007, came a day after the LTTE leadership conferred honours on the Air Tiger pilots involved in the Anuradhapura attack, it said. It says air superiority was an integral part of the government's eastern victories earlier in the year and was likely to play a vital role in the government's campaign of attrition along the north-western coast. "It is therefore likely the LTTE will attempt further attacks on Sri Lankan Airforce Facilities facilities, while committing its forces to slow the army's advance in south-western Vanni," the Jane's study said. The study observed that current guerrilla tactics of the LTTE in east have not been "numerous or audacious" enough to force the Sri Lankan forces to divert its personnel to tackle the unconventional war tactics. "This means the government's northern campaign will slowly advance, seeking to bleed the LTTE by retaining artillery pressure on the Forward Defence Lines and capturing portions of uncleared territory where it can," the study said. It also raised a question mark on the deterioration of the Sea Tigers and the weak air force power of the LTTE. "The denigration of the Sea Tiger fleet precludes all significant ability to dominate the coast or easily transport troops for strategic mobility. The limited aerial capabilities of the Tigers are high profile and may boost morale, but are of little tactical utility," the report said. The defence think tank, however, cautioned against completely writing off the resilient LTTE. "This does not yet suggest an end to the conflict or a military defeat of the LTTE. While it may lose territory, a reversion to guerrilla warfare in the east will likely be matched by a similar tactic in the jungles of the Vanni," the report added. Weaponry will be supplied by "theft" from security forces, with the LTTE's estimated 7,000 fighters offering substantial resistance for years ahead, the journal said. The movement's end has been forecast on many occasions since its inception in the 1970s, and the group has proven "adept at jungle fighting" in previous years, it said. "The current crisis could yet prove to be the catalyst for lethal new innovations on the Sri Lankan battlefield," it said. The Defence Secretary filing action through his Attorney at Law, Sanath Wijewardane, had stated that the article published in the newspaper was animus injuriandi and prayed court to grant him necessary relief and the cost, including interest until the final determination of the case. He informed Court that the articles clearly identified him with photographs and other details and they have been published with malicious intent to damage his reputation. He said several articles published in the newspaper on the MiG aircraft purchases made further allegations against him which were false and defamatory. The Petitioner stated that his reputation suffered both on a personal level and as the Defence Secretary through the publication of the said articles. The Court was told that the petitioner had earlier demanded Rs.250 million as damages for publishing the said material but Leader Publications had not paid the said amount. The petitioner said he hails from a distinguished political family that has served the country with distinction for generations. He joined the Army in 1971 and played an active role in operations against the terrorists. He was awarded the Rana Sura and Rana Wickrama medal by the State in recognition of his bravery. He retired from the Army after a distinguished service of 20 years. He then followed a post graduate computer course at the Colombo University and left for the United States where he worked as a computer systems specialist at the prestigious Loyola Law School. Then he was appointed as the Defence Secretary in 2005 and since then, he has been working with dedication and commitment to lead the decisive battle against terrorism carried out by the Security Forces. He told Court that in order to minimise any irregularities and corruption in the purchases made by the Security Forces he established a completely Government owned company top act as local agent for such purchases, thus saving a large sum that would otherwise have been lost to the country in the form of agents fees and commissions. All these steps have led to unprecedented victories against terrorism. The petitioner said that in this background, the publication of the said articles was designed to tarnish his reputation and credibility. Sri Lanka's central bank plans to hire professionals with expertise in the petroleum industry to support the government's oil exploration and development efforts. It has just advertised for and petroleum economists, geophysicists, petroleum geologistspetroleum risk analysts for positions in the central bank's middle management level. Applicants with qualifications in economics and finance, geology, earth sciences and petroleum engineering, could either be Sri Lankan citizens or foreigners and preferably below 45 years. They will be engaged on a contract for periods of up to five years. The bank said it aims to support and advise the government in its petroleum exploration efforts. Sri Lanka lacks people with skills in the oil industry. The few people with the skills who worked on initial oil exploration activity 25 years ago have long since retired. Oil exploration is being revived only now after offshore surveys indicated the possibility of hydrocarbon deposits in the Mannar basin, off the north-west coast. The petroleum ministry, created a few years ago, has set up a petroleum resources development secretariat (PRDS) to run the search for oil. Its head is a Canadian oil industry professional of Sri Lankan origin. The government called for bids for exploration blocks last year and received bids from three firms, mainly regional players focusing on India and south Asia, for exploration blocks in the Mannar Basin last month. These were ONGC Videsh, Cairn India, and Niko Resources of Cyprus. Recently I read an article by one Rohini Hensman who claimed that ‘tens of thousands of Tamils had been killed in July 1983’. Even the most passion-swelled number does not exceed 3000 and this is a fraction of the total number of Tamils living in the areas where the violence took place. The vast majority that survived those dark days survived in part because Sinhalese intervened, not because all Sinhalese are non-racist (all communities have communal-minded and chauvinistic elements in their midst), but because there are decent human being in all communities. No, I am not downplaying the ‘ethnic’ in the violence that took place or divest myself or the community I belong to of blame, even though as a 17 year old I did my best to fight the thugs who came to plunder the houses of my neighbours. Tamils were most definitely killed during that terrible July and most certainly should not have been. No one should be killed, period. While it is easy to pass the buck on to the then government which looked the other way and also unleashed its thugs on innocent people, society in general cannot fully escape the charge of complicity. Those who killed, those who ordered the killing are the first accused in this tragedy. Those who were unable to save their fellow-citizens are guilty of a lesser crime but are guilty nevertheless because no one need have died. Simply, they were unable to save everyone. Simply, we were unable to save everyone. Simply, I was unable to save everyone. I am not surprised by this ‘tens of thousands’ argument for Hensman belongs to a small pack of ferocious and self-righteous (yes, anti-intellectual) federalists who are wont to move around digits, add and subtract as dictated by preferred political utopia. Take Jehan Perera for instance. In an article titled ‘Engaging with the enemy for the common good’ (Daily Mirror, February 19, 2008), he throws in an interesting quote from Chandrika Kumaratunga: “The JVP and JHU are marginal forces with less than 5% of the total vote. It is this 5% that is making decisions today on behalf of about 90%, This is not even democratic”. That quote is quite out of place with the thrust of Jehan’s article and the flow of the same, but it is square in the middle of his general tendency to fudge the numbers. I am footnoting here that Chandrika has no right to complain about the absence of democracy, and I don’t think Jehan would disagree. The JVP and JHU have close to 50 members in Parliament. That’s more than 20% representation. Let’s assume that the JVP’s true representation was hidden by the fact that they contested in an SLFP-led coalition. Let’s assume that Mahinda Rajapaksa would not have won if not for these two parties, that they in fact designed his manifesto, ran his campaign etc. Let’s assume that these two parties influence decisions. The fact is that their recommendations are accepted by the ruling coalition and the President. Is Jehan (and Chandrika) trying to say that the entire SLFP group in parliament, all those who voted for Mahinda and the UPFA and Mahinda Rajapaksa himself were unwillingly railroaded into embracing JVP/JHU proposals regarding the character of the state, the need to vanquish the LTTE militarily etc? Why doesn’t Jehan (or Chandrika) ‘factor in’ the fact that the UNP has eschewed federalism, which would place them by default in the ‘unitary’ camp? Why does Jehan conflate ‘devolution of power’ with ‘federalism’ (He says, ‘during 1995-2000 70% of the population were in favour of the devolution of power’ and posits this as an indication that ‘from 1995 onwards the Sinhalese were willing to contemplate a solution beyond the unitary state’)? Let’s get the arithmetic right here. Someone who visited Norway recently told me that he was amazed by the fact that many Norwegian subjects (they are still a monarchy by the way) believed that all Sri Lankan Tamils lived in the North and East of Sri Lanka! They were also under the impression that only Tamils lived in the North and East. Jehan knows the truth. He just doesn’t write it. I challenge Jehan to give a breakdown of the numbers: ethnic identity versus residence (province-wise, district-wise), in terms of absolute numbers and proportions, for Sinhalese, Muslims and Tamils. Let’s get back to the Chandrika formula/formulation which Jehan is so in love with. Their thesis is that a small minority are giving policy direction and swaying public opinion away from their pet project, federalism. Now I would like to ask this lady and gentlemen to tell us something about the process in which 70% of the Sinhalese came to be ‘in favour of power devolution’ between 1995-2000. Did ‘enlightenment’ suddenly dawn on them? Did not the deliberate, concerted and moneyed efforts of the then Government which depended heavily on the federalists for policy direction, have something to do with this number (even though it does not, as argued above, indicate an antipathy to the unitary state)? How many numbers does Tissa Vitharana represent? The man does not have a constituency! Add up the representative weight of those who signed the so-called ‘Majority Report’ put together by the APRC, and there’s no majority there. Will Jehan please take issue with the lack of democracy on these counts? Now let’s add up the ‘federalists’. According to Jehan’s logic, the JVP and JHU are anti-federal. The UNP has by admission chosen ‘unitary’ over ‘federal’. The SLFP, willingly (or unwillingly, if we assume the Chandrika/Jehan thesis) stands for ‘unitary’. Who is left? Those 54 confused individuals who wanted Rama Mani reinstated as Executive Director, ICES, the parts of the TNA and SLMC and a few others? Why doesn’t Jehan admit that the federal idea was birthed, nurtured, marketed and even sold to a few influential people (like Ranil Wickremesinghe and Chandrika) by a tiny minority and one which would not have garnered even a single seat if it organized and contested parliamentary elections? If it was ok for that miniscule minority to make decisions on behalf of about 90% of the people, what’s wrong with the JVP/JHU doing it (forgetting of course that the vast majority of those who voted for the UNP and SLFP would not say ‘federalism yeah!’ either)? As for the military initiatives against terrorism, who says ‘no’ these days? Certainly not the UNP. Time was when people like Jehan said ‘the LTTE cannot be defeated’ (an assertion that helped develop the myth of invincibility and a political culture describable in the following terms: ‘we have to concede’), but that’s all gone now. The word in NGO Avenue is that the LTTE will be defeated. So this business of the military ‘option’ (actually it is an imperative) being some JVP/JHU coup is utter rubbish. There will always be Rohini Hensmans. Always, Jehan Pereras. Always those who fudge numbers. Always fear-mongering. Always wild extrapolations. That’s just your day-in-day-out politicking. No moral high horse here. And those who feed the good people at Human Rights Watch this kind of arithmetic (and I have absolutely no doubt that they do) will never put things in proper perspective. Oh, and before we close, let’s get this in: if they failed arithmetic in school, for argument’s sake, could they at least come up with some history that can be substantiated to fix the exclusive traditional homeland claim once and for all? Or are they as bad at history as they are at arithmetic, one can’t help wondering.